An adult bald eagle in flight looks dark except for its white head and tail. Every once in a while, someone in Westborough or surrounding towns looks up and sees – yes! – a bald eagle flying overhead. Our national symbol occasionally makes local appearances. A bald eagle (Haliaeetus leucocephalus) in low flight looks big – because it is. With a body 3 ­feet long and a wingspan of 6-7 feet, it weighs 8-14 pounds. That’s much larger than the red-tailed hawks, turkey vultures, and ospreys that we more commonly see in our local skies. Whether male or female, an adult bald eagle has dark wings and body, with a white head and tail. Immature eagles (1-4 years old) are mottled dark brown with some white. They finally get their white heads and tails in adulthood. Why are these eagles said to be bald? It’s probably because of their white head, but of course their heads are feathered and not bald. To see a bald bird, look at a turkey vulture or a wild turkey. Or every once in a while, you might spot a songbird that’s molting – shedding its feathers and growing new ones – and has no feathers on its head. Bald eagles soar in the sky, or fly with slowly flapping wings. They hold their wings out flat and steady, like planks. They are well outfitted as raptors – birds of prey – with strong, sharp, piercing talons that grasp and kill prey and a large hooked beak for tearing dead prey apart. Where does an eagle overhead come from? Today Massachusetts has at least 30 pairs of bald eagles breeding in the state, according to a 2013 MassWildlife survey of active nests. The nests that are probably closest to our area are at Wachusett Reservoir and in Framingham. Eagles that aren’t paired up and don’t have a nesting territory – often juveniles – tend to wander widely. Bald eagles are mainly fish eaters, so they are attracted to coastlines and large bodies of water surrounded by forest, but they also take small mammals (such as rabbits) and birds (ducks, geese, gulls). You might get a chance sighting of an eagle flying over your garden or even down Main Street, but the likeliest area to see one is over the series of ponds running through Northborough and Westborough – Bartlett Pond, Little Chauncy, Lake Chauncy, and Mill Pond. Bald eagles are also well known as scavengers. (Dr. Mark Pokras of the wildlife clinic at Tufts in Grafton recently noted that a bald eagle had been treated there after being hit by a truck, probably while it was dining on road kill.) Bald eagles also steal prey from other birds such as osprey and herons. Bald eagles mate for life. They usually return to the same nesting territory year after year and often re-use the same nest, making it bigger and heavier as they refurbish it each year. They typically choose a very tall tree for the nest, often a white pine. Their courtship starts in late winter in our area. They typically lay two eggs, but the available food supply usually determines whether both chicks survive. If food is scarce, the older and stronger chick is the one that lives long enough to leave the nest. (Bald eagles lay their eggs a few days apart but start incubating when the first is laid, so the chick from the first egg hatches first and gets a couple of days’ head start in life and the competition for food. Songbirds, in contrast, usually start incubating once all their eggs are laid, so the chicks hatch at about the same time.) Bald eagles that make it to adulthood can live more than 25 years. 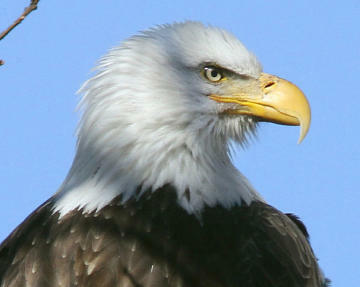 Bald eagles have yellow feet and a large yellow hooked beak. Eagles tend to stay near their nesting territory for as long as possible into the winter, but in our area, as lakes and rivers freeze they eventually move to areas with open water. They often gather in coastal areas. We have bald eagles in Massachusetts today thanks to a very successful restoration program by the Massachusetts Division of Fisheries and Wildlife (MassWildlife) at Quabbin Reservoir 1982-1988. Bald eagles are native to North America and likely were common when European settlers arrived here, but their habitat disappeared as settlers cleared about 80 percent of the state’s forests to create farmland and obtain lumber. Eagles were also routinely shot because people thought they were a threat to farm animals. Then, as industry thrived in the state, their food supply dwindled as fish became scarce due to river pollution. By 1905 bald eagles no longer nested in Massachusetts. After World War II, the widespread use of the pesticide DDT affected species such as osprey and bald eagles, causing their egg shells to be too thin to support the weight of incubating parent birds. In 1967 the bald eagle – our national symbol since 1782 – was federally listed as an endangered species. The prospects for bald eagles improved when DDT was finally banned in 1972. Forests have also been regrowing, even though development continues. Bald eagles started breeding again in Massachusetts in 1989, after 41 eagles were brought here from Michigan and Canada and released during the six years of the restoration program. The parent birds of the first nest were both from the program. Eagle populations have been recovering elsewhere in the U.S. as well. Bald eagles were removed from the federal endangered species list in 2007, and in Massachusetts their state listing was improved from endangered to threatened in 2011. Today, the best areas in the state for seeing eagles include the Connecticut River valley, Quabbin Reservoir, Merrimack River (which contains the waters of the Assabet and Sudbury Rivers, which rise in Westborough and join to form the Concord River, which eventually flows into the Merrimack in Lowell), and the coast. Good times to be on the lookout for eagles are September and April, when bald eagles pass through the state at the height of the fall and spring migrations. Not everyone is lucky enough to glimpse an eagle overhead, but for a close-up look at a pair of bald eagles, consider visiting the Ecotarium (http://www.ecotarium.org) at 222 Harrington Way in Worcester. This natural history museum is home to a pair of bald eagles, named Justice and Liberty, which have been there since 1983 and 1998 respectively. They came to the Ecotarium after sustaining injuries that prevent them from being returned to the wild. 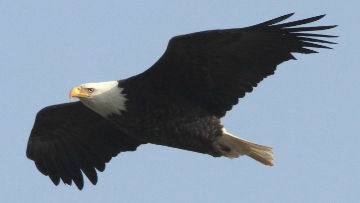 If you do see a bald eagle, let friends and neighbors know by reporting it on the WCLT “Sightings” page (http://www.westboroughlandtrust.org/sightings.php) or by commenting on WCLT president Scott Shumway’s July 14 post about his own sighting on the WCLT Facebook page (https://www.facebook.com/westboroughlandtrust).